Beauticians are responsible for enhancing their clients’ appearances by offering them face and body beauty treatments, such as waxing, manicure, pedicure, eyelash and brow tinting, massage and make-up application, and advising them on beauty care. After consulting with their clients and analysing their beauty needs, beauticians then provide appropriate treatments. Beauticians may perform the following tasks: carry out skin analysis and give advice about skin and body care; perform facial or body massage; analyse body type and advise on exercise programmes and nutrition; use a variety of treatments and electrical equipment; remove facial and body hair by electrolysis or waxing; provide advice and support to clients following cosmetic surgery; recognise problems and refer clients to medical practitioners such as dermatologists, plastic surgeons, endocrinologists, podiatrists, chiropractors and physiotherapists; apply make-up; perform manicures, pedicures, nail extensions, and eyelash and brow tinting; perform reception duties; maintain client records; provide advice on and sell cosmetic products and related beauty equipment. Why did you choose to be a beautician? From an early age I wanted to be a nurse. While I was at high school, I worked as a receptionist over the weekends and spent school holidays working at a beauty clinic. Everything changed thereafter, I fell in love with the beauty industry and decided to pursue it. What training did you do? I completed two years Classique Nail and Beauty academic training and did other modules at the Institute of Thai Massage South Africa. I also attended a Beauty Specialist Training Centre. What makes a good beautician? They must love working with clients and making people feel beautiful and happy. You need to be patient and able to create a relaxing environment. Is experience more important than training? Formal training is vital in this industry, although with experience you learn more each day. We work with doctors, dermatologists, physios – you name it! Products and equipment change all the time, so you need to stay abreast of advancements in technology. Describe a day at work In the morning, I check that the clinic is clean and whether clients have birthdays on that day. I listen to messages, book clients, phone and remind clients of their appointments and ask about their last treatments. I do stocktaking, stock the rooms with products and towels, and then tidy myself up before clients arrive. I offer them tea or coffee, but suggest they drink water as this is important before a treatment. Then we get on with the treatments themselves. What do you enjoy most? My clients; they keep me motivated. They are like family and, even when I am off work, I can’t wait to get back! I also enjoy working alongside my colleagues; we make such a nice team. Anything you don’t enjoy too much? The administration! What are your future career goals? To open my own salon – I’ve got the experience now and would love to run my own business. Advice for youngsters starting out? It’s a good career – you can lecture, work from home, you can take it anywhere. I want to say to those who have lost hope that it’s never too late. If you are working in another job during the day, there are always beauty training centres that run night courses. Mothers with babies can choose to do the modules they like gradually and take it from there. Don’t give up! Why did you choose this profession? As far back as I can remember, I wanted to be a beauty therapist. Knowing that my qualifications allow me to work anywhere in the world was a deciding factor, as was the fact that it’s a business you can potentially run from home. What training did you undertake? I studied at Cape Town Academy after completing my matric. I did a National Diploma in Health and Beauty Therapy and an international ITEC Diploma in Physiatrics and Aesthetician. What traits should a beautician have? They should be a patient person good at listening, someone who enjoys interacting with people. Is experience as important as formal training? Formal training is very important when starting out, but practise makes perfect. When it comes to starting your own business, experience is essential. It takes time to build good relationships with clients, and knowledge about what’s happening in the industry comes from having long-standing relationships with suppliers. Describe a typical day My working day starts at about 9am and I see between six and twelve clients a day. It’s tricky juggling treatments and managing the business, throw in two kids and you have a rollercoaster ride. I enjoy the ride though, every time. What do you enjoy most? The fact that every day is different and you never know who you might meet. Seeing clients leave my salon happy is very rewarding. What aspects are you least keen on? Clients can be very demanding, sometimes even unreasonable. I try my best to keep all my clients happy, but there’s always one! What’s been the highlight of your career? If I can add a date, it would be 15 November 2008: the day my salon opened its doors. Share some future goals I would like to expand my salon, employ more therapists and offer a wider range of treatments. I also want to open a spa in the Karoo. What advice would you give someone starting out? Work hard and build up your experience; look after your clients and they’ll stay with you for a long time; work in at least two salons before starting your own business. Why did you choose the beauty industry? I always enjoyed doing make-up, hair and nails as I was growing up, and also wanted to be able to work for myself and be flexible time-wise. I enjoy it when people leave the studio feeling better about themselves after I have finished giving them a treatment. What training did you undergo? I obtained a two-year international diploma and underwent in-service training at Tops Salons and Spas in Cape Town. What makes for a successful beautician? You need to be able to communicate and take an interest in people’s lives; to be able to relate to them, listen to them and be understanding. Is experience as important as formal training? Yes, definitely. The more practical experience, the better. Describe a typical day in the salon Clean the salon, make sure all the laundry has been done and ensure that the beds have fresh towels. Check the messages, the day’s appointments and stock levels. Do the books, cash up, balance petty cash and do the banking. The rest of the day is hands-on doing treatments with the clients. What do you like the most about your job? That I am constantly doing different treatments, so it never gets boring, and that I get to meet all types of interesting people. I also learn all sorts of new things from them every day. Anything that you aren’t too keen on? That would be the bookkeeping! What’s been the highlight of your career so far? When I opened my own salon in November 2009. What are your goals for the future? To open a few more salons, and to source other beauty products in the market which are not available in South Africa and become a distributor. What advice would you give aspirant beauticians? Don’t become despondent, because salaries aren’t great when you are starting out. Remember that as with most things, practice makes perfect. Describe your job in three words Exciting, Social and Practical. Beauticians need to begin by getting appropriate training. 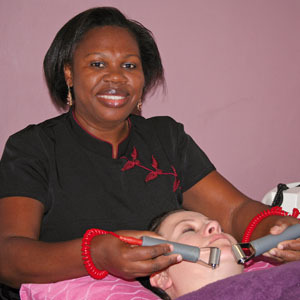 There are many courses offering a Certificate or Diploma in Beauty Therapy. A National Senior Certificate that meets the requirements for a diploma or degree course is a prerequisite for many courses. Make sure that the course is an accredited course that results in a recognised qualification. An NQF qualification is the recognised framework for qualifications in South Africa. The majority of beauticians are self-employed, so a business management or accounting course may be beneficial for future entrepreneurial efforts. It is imperative that beauticians stay up to date on the latest techniques, trends and products.